The NUTRIMAX Engineered Wetland is a vegetated bioretention system for removing nitrogen, phosphorus, bacteria, metals, and TSS. The physical, chemical, and biological processes are utilized for advanced treatment and removal. Solids and dissolved contaminants are removed by this innovative system enabling debris removal without nutrient removal utilizing the HydroSlide system. No filters or cartridges to stop up, no geo-fabrics to clog. LID system for ultra-urban use. Low Maintenance – Media does not require removal for servicing. Unlike other constructed wetlands the NutriMax™ eliminates the need for a pre-filter. Pre-filters are constantly stopping up and failing. The In-line bioremediation system eliminates diversion structures. The advanced biofiltration removes TSS, TP, TN, metals, litter and foliage. treatment, along with variable hydraulic capacity and capabilities. It is simple to service. 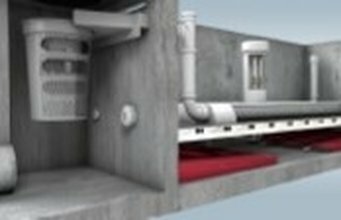 The shielded underdrain has unrestricted water conveyance and does not clog. Sheet flow enters from parking lots, roadways and other non-porous surfaces through curb cuts. Maximum contact with the engineered biofiltration media is designed to allow for passive filtration and biofiltration processes. Up to 80% reduction of Total nitrogen and up to 90% reduction in total dissolved phosphorus based on site conditions and treatment area. Integrated bypass with screening retains trash and debris and eliminates the need for a separate bypass structure. The HydroSlide™ service system enables the lower settling chamber to be easily emptied and the Bold & Gold® media to be back-flushed during servicing. No need to remove the media to service or replace the Bold & Gold® for years. Because the media is serviceable there is no need for pre-filter cartridges. The elimination of pre-filter cartridges greatly improves flow and dramatically reduces the servicing frequency. Nutrimax™ incorporates Hydro-Variant® Technology which enables low to medium flows to be treated to a high-level without compromising the hydrology of the watershed during peak flow events. The screen system in the outflow chamber captures floatables such as litter and foliage during high flow rain events. Treatment is both flow and detention based.